Kybella is a non-surgical, non-invasive, FDA-approved treatment that can minimize or eliminate a double chin. This new injectable helps to define the appearance of your jawline for a slimmer look and improved confidence about your facial appearance. A Kybella treatment takes only an hour and can result in slimming the bulging fat areas under your chin, resulting in a taut, firm neck. Is Kybella a good choice for me? If you have consolidated fat deposits with fullness under the chin, you are a good candidate for Kybella. This treatment doesn’t address sagging or loose skin by itself, although it does help skin in the area to tighten after fat is removed. You will receive a screening before the procedure to make sure that Kybella is the right choice to improve the profile and contour of your neck and jaw. After Kybella, the neck skin tends to lift and tighten as it heals; this means that you won’t have to worry about sagging skin in the area after the fat deposits have dissolved. When you come in for your Kybella appointment, you will receive a treatment recommendation, including the number of treatments needed to best achieve your desired appearance and profile. When a patient comes in for a Kybella treatment, they will receive multiple expertly placed injections in a single procedure. We usually recommend about three to four total treatment sessions, each spaced one month apart, for the best results. In general, patients notice improved tightness and contouring as the treatment continues. Each in-office treatment is scheduled for only one hour and can easily fit in as part of your day. Kybella dissolves fat. It is not a temporary procedure that needs to be repeated down the line; instead, it is a strong solution to a double chin. There is no surgery involved, no incisions and no stitches. How long do I need to wait for results? Results for each patient depend on the profile of their neck and the amount of excess fat under the chin. Kybella needs time to work for optimal results, and most people begin to see results three to four weeks following their injections. As the series of Kybella treatments progresses, results are increasingly visible. Like other injectables, people who try Kybella may experience some discomfort immediately following the injections. This tends to resolve quickly. Patients may also have swelling in the area, but this is a normal part of the healing process and Kybella’s active functioning. What about the safety and effectiveness of Kybella? Kybella’s safety and effectiveness were firmly established in multiple large studies involving over 1,000 patients. Those who received Kybella saw more frequent reductions in fat and an improvement in the appearance of the jawline. In fact, 79 percent of people treated with Kybella were satisfied with the appearance of their chin and neck following the procedure. Patients reported feeling younger and happier and shedding feelings of embarrassment or self-consciousness. 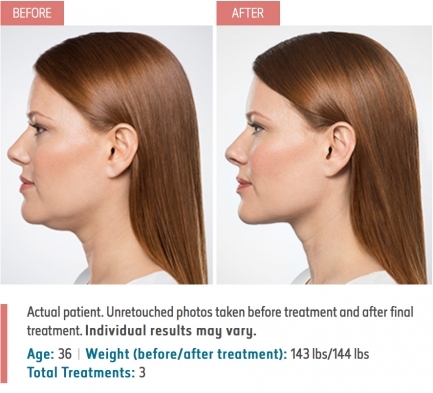 Kybella is an FDA-approved treatment that is proven to work safely. There could be rare side effects from Kybella, including a nerve injury in the jaw that could cause difficulty swallowing or muscle weakness. However, the more common side effects are generally temporary and include swelling, bruising, numbness, redness or pain in the injection site. Only small amounts of fat are dissolved with this treatment, directly where the injections are applied; you don’t need to worry that Kybella will affect other areas of your body. We are the premier laser salon serving New York City located in Manhattan and Brooklyn, NY. Our mission is to provide the most advanced minimally-invasive results-oriented laser aesthetic treatments in a safe yet luxurious environment with an exceptional level of customer service. Client safety is of the utmost importance at our salon! Our team is trained and certified to administer laser services. Each our aesthetician has several years of experience with Lasers treating all Skin Types.